Catalogue of Organisms: What are the Bare Necessities? Valdecasas, A. G., D. Williams & Q. D. Wheeler. 2007. ‘Integrative taxonomy’ then and now: a response to Dayrat (2005). Biological Journal of the Linnean Society 93 (1): 211-216. Before I start this, I feel I should perhaps slap a 'Parental Advisory' warning on it. The link to this article turned up in a Table of Contents e-mail alert a moment ago, and it's gotten me feeling a little steamed up. Not by what was said by Valdecasas et al. - I agree with almost everything they had to say - but with the article they were rebutting. The question behind both articles, ultimately, is the current Taxonomy Crisis - essentially, the fact that there are just too many undescribed species and not enough work being done to identify them. I've written about it before (or just click on the "principles of biodiversity" label attached to this post), so I'll refrain from explaining in detail again. Dayrat (2005) argues that in order to escape this crisis, we need a significant rehaul in how we do taxonomy. However, as Valdecasas et al. (2007) point out, some of his suggested 'solutions' would probably end up doing more harm in the long run than good. Dayrat's call for a more 'integrative taxonomy' translates into the call for taxonomists to work more closely with molecular ecologists and population biologists in establishing species boundaries. In this, he is presenting us with a bit of a truism. It is certainly true that new species should be established on the basis of as much data as possible, and I don't believe any working taxonomist would argue with this. However, this should be an enabling, not a limiting, factor. As much as we would all love to have all that wonderful data when conducting our species revisions, the simple fact is that sometimes (probably even more often than not) we can't count on it. In such cases, surely it is better to go ahead with what data you have available, rather than allow your work to languish indefinitely while you wait for extra data that may never show. Valdecasas et al. provide a quote from Bonde (1977) that rather summarises my feelings on the subject: "An important aspect of any species definition whether in neontology or palaeontology is that any statement that particular individuals (or fragmentary specimens) belong to a certain species is an hypothesis (not a fact)" (emphasis my own). Dayrat complains that the 'over-abundance of redundant species names' (synonyms and nomina dubia) is a major impediment to taxonomy (a nomen dubium, for anyone not in the know, is a taxonomic name for which not enough data is available to firmly establish to what species, etc. it originally referred). His implication is that to much time is being wasted on sorting out these 'redundant names' that should be spent on describing new species. It is true that the ICZN currently does not officially allow for a potential nomen dubium to be set aside for a better characterised later name, but there is a very good reason for that - namely, that the recognition that a name is a nomen dubium is entirely dependent on context, and to a certain degree on author preference. There is no objective standard to what constitutes 'enough data'. What is sufficient in one case may not be in another. Besides, Dayrat is overlooking the historical context of many, if not most, nomina dubia. While they may not be regarded as identifiable now, at the time they were described many such taxa were different from all that had been known to that date, and the original authors can hardly be blamed for failing to predict that their 'unique' new specimen would turn out to be not so unique. I find it a little ironic that Dayrat complains of the "typological approach" of taxonomists, yet speaks favourably of DNA barcoding, a more typological method than almost anything commited by any morphologist (well, except Carl-Friedrich Roewer). For instance, it is a general rule of thumb in vertebrate palaeontology that taxa based on reptile teeth are not diagnostic, because teeth do not vary enough between species of reptiles. 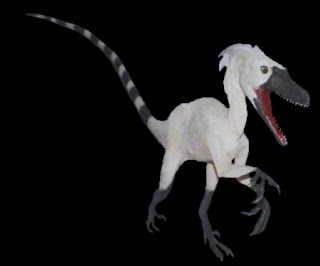 Nevertheless, Troodon formosus (shown at top in a reconstruction from here) was originally based on a tooth, and yet it can be identified as a species with other specimens because there happens to be only one species known from the type locality with that kind of teeth. Of course, the possibility always exists that another species will turn up in the same locality with the same sort of teeth, in which case the identity of the original Troodon becomes uncertain. But I feel that there's little point in playing such 'what if' games - I refer the reader back to the Bonde quote above. "No new species names should be created in a given group unless a recent taxonomic revision has dealt with the totality of the names available for the group." Valdecasas et al. 's primary response to this is "define recent". Many groups have not been substantially revised for a great many years (for instance, the last complete review of many harvestman families was probably Roewer's Die Weberknechte der Erde in 1923). Still, many of these ancient revisions are still considered very reliable due to the thoroughness of the original author. Even when there isn't a good revision available, this may not be an impediment to taxonomic work. Revising an entire group is a major task, and making it the minimum expectation will simply cause researchers to shun poorly studied groups, leaving them to languish in their taxonomic pits. The taxonomic crisis would then worsen rather than improve. As a point of contrast, I have commented before on the systematic quagmire of South American harvestmen. For a number of years now, a colony of South American arachnologists have slowly been chipping away at this heaping mess, sorting out issues where they could. As a result, parts of the picture are slowly coming into view, and there is hope for more unravelling to come (e.g. Kury, 2003). It is true that some findings have been published as separate papers that could have arguably been included in the same publication (an artefact, I believe, of an academic accreditation system that values total number of publications to the individual quality of said publications), but overall the value of their work is, I think, unarguable. "A set of specimens differing in some regard from existing species can be described with the abbreviation 'sp.' (for 'species') and not with a real species name regulated by the codes of nomenclature." Technically true, but not so hot in practice. Dayrat is overlooking that 'sp.' is often used in species lists to indicate specimens that can be identified to a genus but not to one of the species within a genus - usually, with the implication that the specimens cannot be reliably identified. Also, Dayrat is overlooking the power that names have when catching people's memory. Things named 'sp.' slip into obscurity, while taxa with actual names hold their place. Witness how even when a taxon becomes widely known (say, as a conservation target) before it gets officially described, the need to label it with a tag is inescapable. The Mahoenui giant weta was appearing as 'Deinacrida sp. Mahoenui' long before Deinacrida mahoenui was officially published. And because there are no regulations governing the use of such informal tags, they cause more confusion if allowed to persist without a suitable official replacement than otherwise. "Ideally, names should only be created for species that are supported by broad biological evidence (morphology, genealogical concordance, ecology, behaviour, etc.)." Again, this is true, but how broad? As Valdecasas et al. point out, there is no upper limit to how much data could potentially be collected. Again, surely it's better to highlight the fact that an interesting new taxon potentially exists than to allow it to remain hidden? "No new species names should be created if type specimens deposited in a museum collection are preserved in a way that prevents any further molecular study." Also: "All neotypes designated from now on should be preserved in a way that allows DNA extractions and sequencing." Aaaaaaaaaaaargh! NO! Dayrat is overlooking that retaining specimens for molecular analysis often renders them unusable for other forms of analysis. If I was collecting arachnid specimens, I would have to decide on collection whether to put it into 70% alcohol or 100% alcohol for preservation. In 70% alcohol, the specimen's morphology remains preserved, but DNA degrades fairly rapidly because of the presence of water. However, if I was to put the specimen in 100% alcohol, the absence of water dessiccates all membranes, rendering the specimen brittle and immobile, unusable for morphological analysis. The problem is even worse for entirely soft-bodied animals, which may shrivel in 100% alcohol to unidentifiable lumps. In the case of arachnids, the researcher may get around the problem by preserving most of the specimen in 70% alcohol, but remove a couple of legs and put them in 100%. But what would s/he do if s/he was working on rotifers, or some other minute organism? The appropriate means of preservation should be dictated by the requirements for identifying the particular taxon, not by any theoretical standard. Ultimately, the problem with Dayrat's suggestions is that he is confusing the position of the donkey and the dray. Ultimately, the recognition of a new species is a hypothesis based on a collection of data to be tested by further data, not a data point in itself. If a set of objective 'minimum requirements' is imposed, it will probably have the negative effect of discouraging research and publication, and the taxonomy crisis will worsen rather than improve. 'Minimum requirements' may sound good in theory, but practical considerations speak otherwise. As Valdecasas et al. note, "In any case, experience demonstrates that it is far more detrimental to be a ‘lumper’ than a ‘splitter’, in contrast to Dayrat's assertion. If variation previously assigned to two species turns out to be more economically assigned to one, synonymy of subsequently identified specimens will easily solve the problem. When the same name has been given to specimens that exhibit enough variation to include several species, it is considerably more difficult to recover in subsequent work which identifications correspond to which species unless there is a repository of all specimens; and that is not always the case, as it is very common in much ecological work to refrain from preserving the specimens upon which the identifications were based, leaving no option for further rigorous identification." The taxonomy crisis will not be resolved by imposing outside standards (which incompetent workers will ignore anyway), but by knuckling down and describing species. Bonde N. 1977. Cladistic classification as applied to vertebrates. In Major Patterns in Vertebrate Evolution (M. K. Hecht, P. C. Goody, & B. M. Hecht, eds.) pp. 741-804. Plenum Press: New York. Dayrat, B. 2005. Towards integrative taxonomy. Biological Journal of the Linnean Society 85 (3): 407-415. What about non-systematic research on unidentifiable species? Unidentifiable because the systematics is known to be woefully incomplete. At the minimum, voucher specimens should be deposited so that the identity of the species can be determined later. But what name should it go by? For example, I study the Evaniid wasps. I have a series of 40 or so species from one trap in Ecuador that are unidentifiable, and likely 50% or more are new species. If I wanted to write a paper about the local species diversity, should I avoid names? That would mean that voucher specimens could never be integrated into collections until some later paper published their identities. Whereas if I gave them names (some, doubtless synonyms) with vestigial descriptions or photopgraphs, they could be integrated into collections and thus easily available to systematists for taxonomic study. Mike, I'm inferring from your comment that you're not actually planning on doing the systematics yourself, but you are sorting to morphospecies. I'm currently working alongside people conducting ecological surveys that are also coming back 90% undescribed species, so I can sympathise with your dilemma. Most collections will take, and can probably access*, unidentified specimens, though it would be more helpful to everyone if they can be identified as far as possible. I'd guess that at least 95% of every museum's collection is unidentified. Unless you're planning on doing a formal description, it would be far better if you didn't give your morphospecies actual names, because that would probably do more harm than good when someone came to do the full taxonomic revision (the nomen nudum is an evil thing). My advice would be to voucher all of your morphospecies. At least a sequential number that's included with the specimen label when you hand your specimens to a collection. Even better (if you were publishing your results) would be to get accession numbers for your specimens from the collection (e.g. AMNH 6132 would be the 6132nd specimen registered at the American Museum of Natural History) and refer to the morphospecies using the accession number as the voucher number (e.g. Evania sp. AMNH6132, were there such a thing). *The limiting factor in registering specimens in museum collections and such isn't usually identification, it's the availability of someone to actually enter the specimen data into the records or database. There are certainly better ways to do taxonomy. Naming an animal based on fragmentary remains doesn't happen so much anymore, but the anals of paleontology are clogged with quickly-named genera and species which can probably be reassigned or can't be assigned at all. Did you know that pachycephalosaurs were originally thought to belong to Troodon because of similarities in the teeth? The first big review of the pachycephalosaurs is called "A Review of the Troodontidae." In it, Pachycephalosaurus is described! At any rate, I think that museum collections are sorely ignored. You can find just as many (if not more) species in the basement these days than in the field. Zach, I'm not denying the presence of nomina dubia, though some groups of organisms are more afflicted than others. My point is that there's no way of a priori establishing whether a given taxon is dubious or not. I was aware of the Pachycephalosaurus-Troodon connection. On the flip side, consider the two Dinornis species recognised by ancient DNA studies that are osteologically identical (as far as I know). In this case, no degree of completeness of the skeleton is going to identify the species if molecular data is unavailable. As Valdecasas et al. note, we will always have bad taxonomists with us. My feeling is that by setting the bar so unrealistically high, Dayrat actually ends up favouring bad taxonomists who simply ignore the guidelines rather than good taxonomists who refrain from publishing because they cannot fulfil all the requirements with the material available. Also, as I said, Dayrat's recommendations effectively discourage research on poorly known groups, systematic work on which must necessarily start falteringly. I certainly agree with your comments on museum collections - I'm currently working entirely from pre-collected specimens myself. To a large extent, it depends on exactly what your requirements are for whatever study you're conducting. That "Troodon" reconstruction has an terribly dromaeosaurid skull.... Should you ever need another troodontid illustration feel free to use mine (of a soon-to-be-described, early troodontid). Personally, I find the assertion of Troodon formosus as a valid name a bit bizarre, when most other non-mammalian tooth taxa are considered dubious. Bring back Stenonychosaurus inequalis! Again, as I understand it the "validity" of Troodon is directly contingent on the absence of any other contender's for the holotype's identity from the type locality. The possibility always exists that said contender could turn up tomorrow, but until that day comes I feel it's better to try and make sense of what we have on hand. Of course, the ICZN always exists as a dealbreaker if things get too messy, as happened for Coelophysis. Mind you, the Coelophysis decision was a fairly unusual one, and I don't know that Troodon has the following that Coelophysis does. My experience is that when faced with a potential nomen dubium, authors generally take one of two options. One - the 'Gordian knot' approach - is to treat the nomen dubium as an effectively invalid name and more or less ignore it. The other - the 'port in a storm' approach - is to go to whatever measure is necessary to attach the name to some available taxon. I must confess to favouring the second approach where possible - I feel that the first approach leads to an excess of taxa. Those nomina dubia are still valid names, and will still be around to haunt future researchers. But then, I work with recent taxa for which the chance of resolving dubious names satisfactorily (for instance, by going out and collecting more specimens from the type locality) is often much higher than with fossil taxa. The problem with the 'port in a storm' approach, of course, is that then the poor condition of the holotype becomes a lounge-pachyderm that could always cause everyone grief later. Oops, I was going to add: Again, I feel that selecting the appropriate response to any individual nomen dubium should probably be left to the judgement of the researcher working on the specimens. These are interesting issues. I read Benoit Dayrat's paper a couple of years ago & had more or less the same objections to his suggestions that are raised here. I have also listened to his talks at the American Malacological Society Meetings. If I am not mistaken, some of his suggestions tie in with the Phylocode rules. Chris, great work on this post. I mostly agree with you so I won't comment too much. One of the groups I work on are anemones. There is absolutely no way to preserve them for histology than by 30% formalin. Ethanol is out of the questions and low concentrations of formalin do not adequately penetrate the tissue fast enough. The result being an unidentifiable specimen (anemones are ID'd based on histological characters). Dayrat's preservation protocol would destroy my samples. If anyone has ever tried to ID and describe a bag a goo, then they would understand. I also attach names to everything, sometimes because I'm a little overconfident, but if I have any doubt I refer to it as aff.. If I think its new then Family sp. or Genus sp. Its both how I was trained and what makes sense to me and makes everything easier to catalogue and sort.